Heat the oil in a frying pan, add the onion and cook for 5-6 minutes until softened. Add the garlic and cook for another minute. Transfer to a bowl and cool slightly. Add the mince, French's Classic Yellow Mustard and rosemary along with some salt and pepper and mix well. Divide the mixture into 10 portions and shape into burger patties. Reheat the pan and fry the burgers over a high heat for 3 minutes, turn, top the cooked side with cheese and cook for another 2-3 minutes (or place under a hot grill). 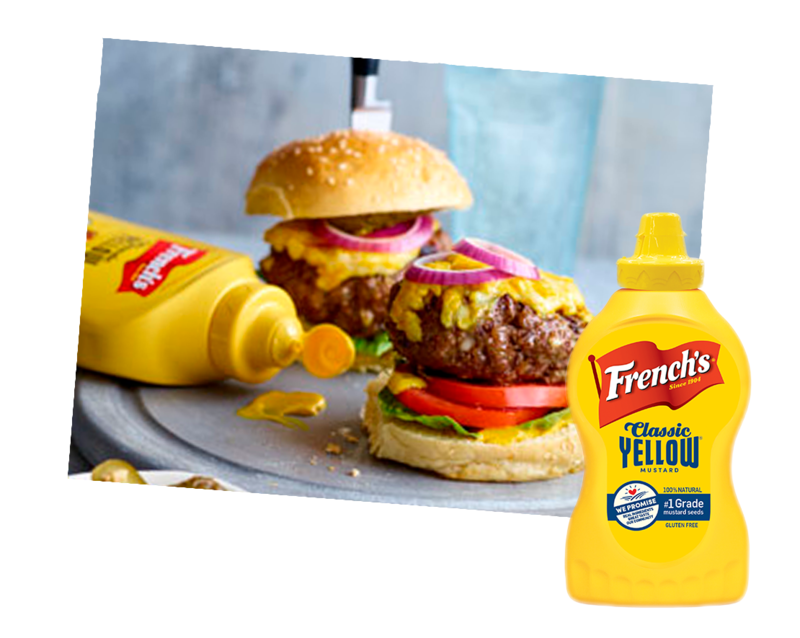 Lay out the buns and spread the tops and bottoms with some mayonnaise and extra French's Classic Yellow Mustard. Top the bases with lettuce followed by a burger each and the topping, then add tomato, onion rings and gherkins. Use a skewer to secure the lid and serve.